Jehovah’s Witnesses – What is the truth? Home/Page Two/Jehovah’s Witnesses – What is the truth? ← Will Love of Neighbor Move You to Speak? These are just a sampling of the accusations against and claims made by the Watchtower. One thing is certain: The Watchtower Bible and Tract Society and Jehovah’s Witnesses are one of the most controversial religious organizations in the world. But what is the truth? It is Saturday morning. The door bell rings. 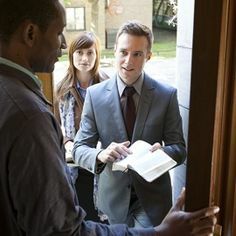 At your door are two well-dressed people who politely greet you and introduce themselves as Jehovah’s Witnesses. They begin speaking about a world to come of peace and infinite happiness. And you are invited to learn how you can live forever in paradise on earth. Most people seem to resent the intrusion. They are not interested in living in a new world. It sounds crazy to them —too good to be true. Besides, most people like this world fine. But for a special few that knock on the door was literally an answer to their prayer and the best thing that ever happened to them. They accept an offer of a free home Bible study. Over weeks and months they learn the basic teachings of the Bible —the truth. They learn that God has a name and a Kingdom —a government, that is going to be run by none other than Jesus Christ. What an awesome thing, to know that the Kingdom of the Heavens will eventually crush all the kingdoms and governments of this world. 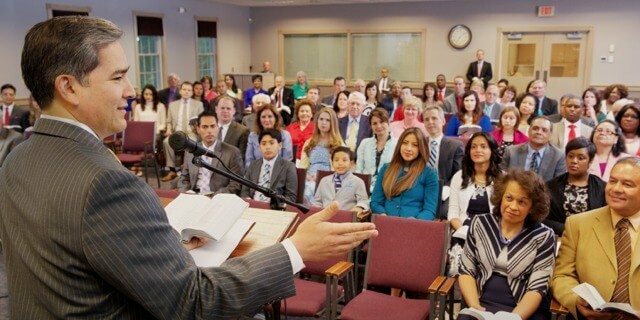 They accept the invitation to attend meetings at the local kingdom hall. They are warmly greeted and feel at home and begin to make fast friends with various congregants. Eventually they become Jehovah’s Witnesses themselves and go out to preach the message and teach others the truth, just as Jesus commanded his disciples to do. But now, what about all the controversy? Is the Watchtower a cult? Does it fit the biblical criteria of a false prophet? And what about all the press reports in recent years regarding child molestation among Jehovah’s Witnesses? What is the truth? The answer to all of the above is a qualified yes. More importantly, though, the real question is: Do these evils preclude the Watchtower from currently functioning in the capacity of Jehovah’s earthly organization, as advertised? Expressed differently —does the presence of stumbling blocks necessarily nullify the work and faith of Jehovah’s Witnesses? And the answer to both is no. Still, it is undeniable that the Watchtower exerts an inordinate control over the spiritual lives of Jehovah’s Witnesses. The real question is: What if in the future the Watchtower’s influence becomes positively deleterious? That may seem improbable now, but there is a scenario whereby that will be unavoidable. And what is that? The unexpected return of Christ in his glorious parousia. At the present moment Jehovah’s Witnesses refuse to even consider the possibility. The Watchtower has assured them that there cannot be another world war and other events such as food shortages and pandemics, that would fulfill the sign of the time of the end more convincingly than what occurred a century ago. Because the Watchtower attaches no importance to current world events Jehovah’s Witnesses are oblivious to the significance of the developing crisis that some sober-minded observers are calling the prelude to World War Three. Under those circumstances the 1914 doctrine will collapse and with it the credibility and authority of the Watchtower, making them guilty of misleading Jehovah’s Witnesses as to the timing and manner of the return of Christ; hence, false prophets. This is not merely a hypothetical “what if?” It is a certainty. Christ himself sternly forewarned his followers of a powerful misleading influence that would prevail during the tribulation that could even deceive the chosen ones, if that were possible. As it stands presently, those who are called into the Kingdom only recognize one authority that functions as Jehovah’s earthly mouthpiece and that could have any influence over them — the Watchtower. The “city” to come is the very Kingdom of God and Jehovah’s Witnesses will be required to leave the “camp” of the Watchtower organization when the time arrives. It will be a test of faith unlike anything before. The truth is, the Watchtower has served a vital function up to this point. It has spearheaded the greatest preaching work in the history of Christianity. The organization has served as a rallying point and a seedbed for the final members of the composite bride of Christ and instilled in a great multitude the hope of inheriting the earth in the aftermath of the great storm that is coming. What comes next? In the 12th chapter of Revelation Satan the Devil is called “the accuser of our brothers… who accuses them night and day before our God.” However, should we suppose his accusations are baseless? Not at all. There is no doubt the Accuser’s aspersions have some validity. For example, when Satan came before Jehovah to accuse the man Job the Devil claimed that God protected him from calamity. That was true. God did protect him. Also, Jesus informed the apostles that Satan had demanded to have them to sift them as wheat. In other words, he wanted to have their faith in Christ put to the test. And his demands were granted. If we were to use our imagination, what might we suppose the Accuser is up to now? It is hard to imagine that his foremost demand is not to have the Watchtower under his control in order to test the faith of Jehovah’s Witnesses to the limit. According to the prophets Jehovah’s purpose involves that very thing. The coming of Christ will not only bring about the judgment of the house of God (“Bethel” in Hebrew), but present an entirely new reality apart from the institution of the Watchtower. Only those with faith in the unshakable Kingdom of God will be able to make the transition. And that is the truth.